Tapir (pronounced as in "taper," or IPA "təˈpɪər," pronounced as in "tap-ear") are large, browsing, mammals with short, prehensile snouts comprising the Tapridae family of the odd-toed ungulates (Perissodactyla order). Although pig-like in appearance, their closest existing relatives are the horses and rhinoceroses. There are four extant (living) species, all within the Tapirus genus: Baird's tapir (Tapirus bairdii), Malayan tapir (Tapirus indicus), mountain tapir (Tapirus pinchaque), and Brazilian tapir or lowland tapir (Tapirus terrestris). Tapirs inhabit jungle and forest regions of South America, Central America, and Southeast Asia. The tapir as a group provides a value for the ecosystem and for humans at the same time that it advances its own individual purpose of maintenance, survival, and reproduction. Ecologically, it contributes to food chains, browsing on a variety of aquatic plants, fruit, and other vegetation, while also being a source of food for various animals (jaguar, crocodiles, etc.) For humans, the tapir long has been a source of food and the hide provides for an excellent leather. In addition, tapirs add to the wonder of nature for people. However, declining habitat and hunting pressure has contributed to declining populations to the point that all four species of tapir are classified now as endangered or vulnerable. 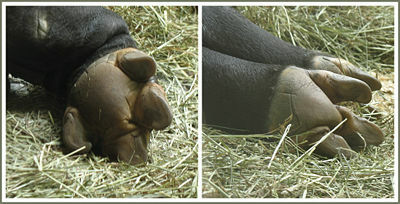 As odd-toed ungulates (Order Perissodactyla), the central axis of the foot passes through the third toe. Tapirs have splayed, hoofed toes, with four toes on the front feet and three on the hind feet. The form of the feet helps them walk on muddy and soft ground. Size varies between species, but most extant tapirs are about 2 meters (7 feet) long, stand about a meter (3 feet) high at the shoulder, and weigh between 150 and 300 kilograms (330 to 700 pounds). Coats are short and range in color from reddish-brown to gray to nearly black, with the notable exceptions of the Malayan tapir, which has a white saddle-shaped marking on its back, and the mountain tapir, which has longer, woolly fur. All tapirs have oval, white-tipped ears, and rounded, protruding rear ends with stubby tails. 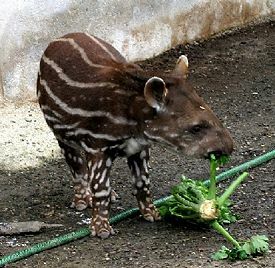 Baby tapirs of all types have striped-and-spotted coats for camouflage, and while they appear at first glance to be alike, there are some differences among the patterns of different species. Females have a single pair of mammary glands (Gorog 2001). 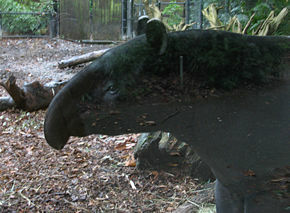 The proboscis of the tapir is a highly flexible structure, able to move in all directions, allowing the animals to grab foliage that would otherwise be out of reach. Tapirs often exhibit the flehmen response, a posture in which they raise their snouts and show their teeth, in order to detect scents. This response is frequently exhibited by bulls sniffing for signs of other males or females in oestrus in the area. Proboscis length varies among species; Malayan tapirs have the longest snouts and Brazilian tapirs have the shortest (Witmer et al. 1999). The development of tapir probosces, made up almost entirely of soft tissues rather than bony internal structures, gives the Tapiridae skull a unique form in comparison to other perissodactyls, with a larger sagittal crest, orbits positioned more rostrally, a posteriorly telescoped cranium, and a more elongated and retracted nasoincisive incisure (Witmer et al. 1999; Colbert 2002). Tapirs have brachyodont, or low-crowned, teeth that lack cement. 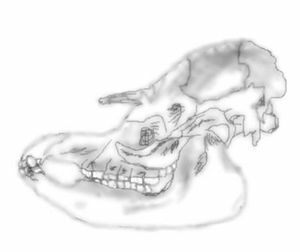 Their dental formula is I 3/3, C 1/1, P 4/3-4, M 3/3, totaling 42 to 44 teeth; this dentition is closer to that of equids (family Equidae), who may differ by one less canine, than their other perissodactyl relatives, rhinoceroses (Ballenger and Myers 2001; Huffman 2007). Their incisors are chisel-shaped, with the third large, conical upper incisor separated by a short gap from the considerably smaller canine. A much longer gap is found between the canines and premolars, the first of which may be absent (LTKCE 1911). Tapirs are lophodonts, and their cheek teeth have distinct lophs (ridges) between protocones, paracones, metacones, and hypocones (Myers et al. 2006a, 2006b). Tapirs have brown eyes, often with a bluish cast to them which has been identified as corneal cloudiness, a condition most commonly found in Malayan tapirs. The exact etiology is unknown, but the cloudiness may be caused by excessive exposure to light or by trauma (TG 2007a; Janssen et al. 1996). However, the tapir's sensitive ears and strong sense of smell help to compensate for deficiencies in vision. Female Malayan tapirs reach sexual maturity between three and four years of age (males at five years of age) (WPZ 2007), with females coming into oestrus every two or three months (WPZ 2007; BBC 2007). Under good conditions, a healthy female tapir can reproduce every two years; a single youngster is born after a gestation of about 13 months. The natural lifespan of a tapir is approximately 25 to 30 years, both in the wild and in zoos. Little is known for sure about tapirs’ mating patterns in the wild: there is some evidence that mature tapirs mate with the same partner for life, but pairs spend little or no time together aside from sexual activity (Morris 2005). Apart from mothers and their young offspring, tapirs lead almost exclusively solitary lives. Although they frequently live in dry-land forests, tapirs with access to rivers spend a good deal of time in and under the water, feeding on soft vegetation, taking refuge from predators, and cooling off during hot periods. Tapirs near a water source will swim, sink to the bottom, and walk along the riverbed to feed, and have been known to submerge themselves under water to allow small fish to pick parasites off their bulky bodies (Morris 2005). Along with fresh water lounging, tapirs often wallow in mud pits, which also helps to keep them cool and free of insects. In the wild, the tapir’s diet consists of fruit, berries, and leaves, particularly young, tender growth. Tapirs will spend many of their waking hours foraging along well-worn trails, snouts to the ground in search of food. Baird’s Tapirs have been observed to eat around 40 kilograms (85 pounds) of vegetation in one day (Todd and Wilson 2001). Tapirs are largely nocturnal and crepuscular, although the smaller mountain tapir of the Andes is generally more active during the day than its congeners. They have monocular vision. Adult tapirs are large enough that they have few natural predators, and the thick skin on the backs of their necks helps to protect them from threats such as jaguars, crocodiles, anacondas, and tigers. The creatures are also able to run fairly quickly, considering their size and cumbersome appearance, finding shelter in the thick undergrowth of the forest or in water. 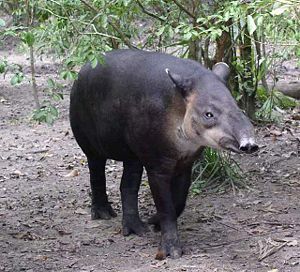 Hunting for meat and hides has substantially reduced their numbers and, more recently, massive habitat loss has resulted in the conservation watch-listing of all four species: both the Brazilian tapir and the Malayan tapir are classified as vulnerable; and the Baird’s tapir and the mountain tapir are endangered. Tapirs tend to prefer old growth forests and the food sources that can be found in them, making the preservation of primary woodlands a top priority for tapir conservationists. The tapir family is old by mammalian standards. The earliest fossil tapir dates to the early Oligocene (about 30 million years), and Eocene rocks from as early as 55 million years ago contain a wide range of tapir-like animals, and they have changed little since (Taylor 2007). Perissodactyls, including tapiroids, became the predominant large terrestrial browsers through the Oligocene, and many members of the group survived until the late Pleistocene. 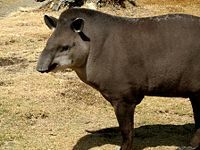 It is believed that Asian and American tapirs diverged around 20 to 30 million years ago, and that tapir varieties moved from North America to Central and South America around 3 million years ago (Ashley et al. 1996). The Malayan tapir, the species most isolated geographically from the rest of the genus, has a significantly smaller number of chromosomes and has been found to share fewer homologies with the three types of American tapirs. A number of conserved autosomes (13 between karyotypes of the Baird’s tapir and Brazilian tapir, and 15 between the Baird’s and mountain tapir) have also been found in the American species that are not found in the Asian animal. However, geographic proximity is not an absolute predictor of genetic similarity; for instance, G-banded preparations have revealed that Malayan, Baird’s and Brazilian tapirs have identical X chromosomes, while mountain tapirs are separated by a heterochromatic addition/deletion (Houck et al. 2000). Lack of genetic diversity in tapir populations has become a major source of concern for conservationists. Habitat loss has isolated already small populations of wild tapirs, putting each group in greater danger of dying out completely. Even in zoos, genetic diversity is limited; all captive mountain tapirs, for example, are descended from only two founder individuals (CMZ 2006). 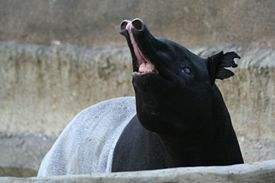 Hybrid tapirs from the Baird's tapir and the Brazilian tapir were bred at the San Francisco Zoo around 1969 and produced a second generation around 1970 (TG 2007b). Tapirs are generally shy, but when they are scared they can defend themselves with their very powerful jaws. In 1998, a zookeeper in Oklahoma City was mauled and had an arm severed by a tapir bite, after she attempted to feed the attacking tapir's young (Hughes 1998). In 2006, a 46-year-old man (who was the Environmental Minister at the time) who was lost in the Corcovado National Park at Costa Rica was found by a search party with a "nasty bite" from a wild tapir. However, such examples are rare; for the most part, tapirs are likely to avoid confrontation in favor of running from predators, hiding, or, if possible, submerging themselves in nearby water until a threat is gone (Goudot 1843). In Chinese, Korean, and Japanese, the tapir is named after a beast from Chinese mythology. A feature of this mythical creature is a snout like that of an elephant. It is said to eat people's dreams. 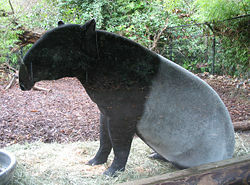 In Chinese, the name of this beast, subsequently the name of the tapir, is mò in Mandarin and mek in Cantonese. The Korean equivalent is maek, while it is called baku in Japanese. Ashley, M. V., J. E. Norman, and L. Stross. 1996. Phylogenetic analysis of the perissodactylan family tapiridae using mitochondrial cytochrome c oxidase (COII) sequences. Mammal Evolution 3: 315-326. BBC. 2007. Wildfacts sheet on the Brazilian Tapir (Tapirus terrestris). BBC. Retrieved September 7, 2007. Cheyenne Mountain Zoo (CMZ). 2006. Mountain tapir conservation at the Cheyenne Mountain Zoo. Cheyenee Mountain Zoo. Retrieved September 7, 2007. Colbert, M. 2002. Tapirus terrestris. Digital Morphology. Retrieved June 20, 2006. Gorog, A. 2001. Tapirus terrestris. Animal Diversity Web. Retrieved June 19, 2006. Goudot, J. 1843. Nouvelles observations sur le Tapir Pinchaque (Recent observations on the tapir pinchaque). Comptes Rendus vol. xvi, pages 331-334. Available online with English translation by Tracy Metz. Retrieved September 7, 2007. Ballenger, L., and P. Myers. 2001. Tapiridae. Animal Diversity Web. Retrieved June 20, 2006. Houck, M. L., S. C. Kingswood, and A. T. Kumamoto. 2000. Comparative cytogenetics of tapirs, genus Tapirus (Perissodactyla, Tapiridae). Cytogenetics and Cell Genetics 89: 110-115. Huffman, B. 2007. Order Perissodactyla. Ultimate Ungulate. Retrieved September 7, 2007. Hughes, J. 1998. Woman's arm bitten off in zoo attack. Associated Press, November 20, 1998. Retrieved September 7, 2007. Janssen, D. L., B. A. Rideout, and M. E. Edwards. 1996. Medical management of captive tapirs (Tapirus sp.). American Association of Zoo Veterinarians Proceedings, November 1996. Retrieved September 7, 2007. LoveToKnow Classic Encyclopedia. 1911. Perissodactyla. LoveToKnow Classic Encyclopedia Based on Encyclopedia Britannica 1911 Encyclopedia. Retrieved September 7, 2007. Morris, D. 2005. Face to face with big nose. BBC Wildlife, March 2005, page 37. Myers, P., R. Espinosa, C. S. Parr, T. Jones, G. S. Hammond, and T. A. Dewey. 2006a. The diversity of cheek teeth. The Animal Diversity Web. Retrieved June 20, 2006. Myers, P., R. Espinosa, C. S. Parr, T. Jones, G. S. Hammond, and T. A. Dewey. 2006b. The basic structure of cheek teeth. The Animal Diversity Web. Retrieved June 20, 2006. Tapir Gallery (TG). 2007a. Tapirs described. The Tapir Gallery. Retrieved September 7, 2007. Tapir Gallery (TG). 2007b Handsome hybrid in the San Francisco Zoo, San Francisco, California. Tapir Gallery. Retrieved September 7, 2007. Taylor, K. 2007. Miotapirus marslandensis. Keltationsart. Retrieved September 7, 2007. Todd, S., and K. Wilson. 2001. Tapir news. TPF News 4(7). Retrieved September 7, 2007. Witmer, L., S. D. Sampson, and N. Solounias. 1999. The proboscis of tapirs (Mammalia: Perissodactyla): A case study in novel narial anatomy. Journal of Zoology London. 249: 249-267. Retrieved September 7, 2007. Woodland Park Zoo (WPZ). 2007. Animal fact sheet: Malayan tapir (Tapirus indicus). Retrieved September 7, 2007. This page was last modified on 16 November 2015, at 17:03.